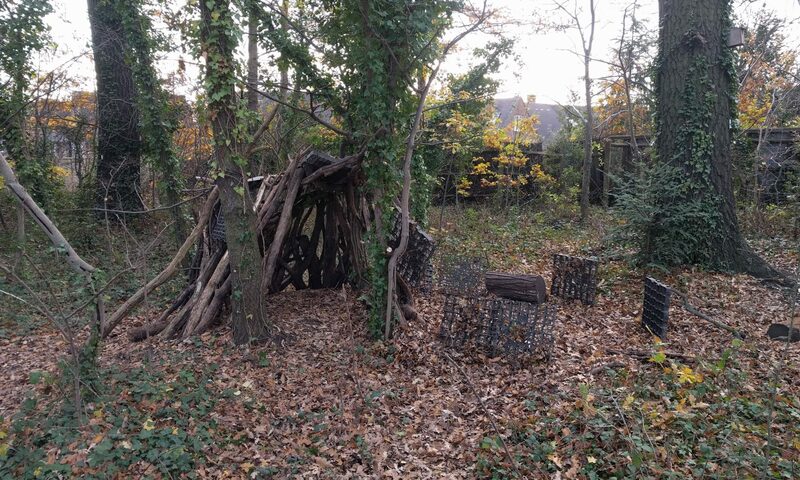 Free we Grow (FWG) is a community of children who meet three days a week at Dacres’ Wood Nature Reserve in South East London. It is inspired by the idea that the best way to learn and grow is in the real world, and hence we have a loose structure which reflects the spaces where any human will spend their life – namely at home, visiting, hosting, and collaborating. These spaces are not fixed in place and time but are fluid and interweave. The majority of our time at FWG is spent at home, at Dacres’ Wood. This is the space where the children, whether as individuals or as a community, decide for themselves how to spend their time and what rules bind us together. On a day to day basis this takes the form of play and self-directed activities. We use a slowly growing array of resources which we’ve acquired as and when the need for them has emerged. We also spend a lot of time in the forest, playing, exploring, climbing, building, running, making and doing. During the daily meeting, children may share their plans for the day to invite collaboration, or ask for help if needed. The meeting is also the forum in which our rules of engagement are established and where issues are discussed. It is an active forum where our culture is daily formed and where the children are the leading agents in its formation. The meeting is led by the children and depending on the topic, decisions are made democratically or sociocratically using a tool called ‘roundspeak’. Ad-hoc issues which emerge can be resolved by calling a ‘small meeting’, which any member of the community can do if they are unable to resolve a problem independently. Other members of the community can be invited to help mediate these meetings. As the nature reserve is also a home for wildlife and is enjoyed by other user groups during other days of the week, our home dynamics are inevitably also influenced by a growing appreciation and understanding of the nature of the space itself. When we’re not at home, we’re out; and being out in the world we come into contact with other people, places, knowledge, ideas, approaches and feelings. While we have a coherent culture at home, we learn to adapt to other spaces and groups when we are visiting. While we know and understand the mechanisms for bringing about a change in culture at home, this is more complex when visiting other spaces, as the nature of our individual and group agency changes. By observing different ways of being, we reflect on our own mechanisms and ways of being, and we see choices, we grow and learn. The visits we take part in are not created, manufactured or designed to ‘educate’ the children. To the extent possible, we seek to be responsive and facilitate visits which emerge out of real interests. We also naturally connect to our local environment and community as an extension to our home space by visiting local parks and amenities and getting to know our neighbours. The third space is the Hosting Space. When we’re not home alone, or out in the world, we may host. The children’s interests lead to a desire to engage with others and hence we invite guests. Many of these guests are parents, family members and friends who have a particular expertise, skill or passion and we are in the process of developing a library of skills to map this. As we occupy a nature reserve and there are also many reasons why people may want to use the space for their own interests. Hence we aim to embrace these genuine interests by hosting artists, ecologists, conservation volunteers, persons interested in democratic education, or others who may want to use the space for their own genuine place related projects. As hosting can have an impact on the stability of the home culture, this space is developing gradually and always consensually. The Buzz Space is the space for collaboration and recognises that as a democratic community we need to be able to take decisions and work together to make larger projects happen. The Buzz space is therefore an intentional space designed to facilitate interest driven group or whole community projects. A buzz space can be initiated by a random conversation between two community members, who decided to bring an idea to the meeting, propose a project, and find collaborators with whom to work. For example, when the idea to have a Christmas Show was suggested at a meeting and voted through, a Buzz Space was created through which the program was arranged, the roles were allocated and the logistics were managed. Or when the cost of a proposed trip was prohibitive, the children together organised a stall, prepared crafts and snacks to sell and raised over half the cost of the trip, allowing it to take place. Through the Buzz space, ideas for visits and hostings are planned out. The Buzz space takes the design of children’s group activities out of the facilitators’ hands and into the group’s control. The mechanisms for managing buzz projects are in the process of being refined.